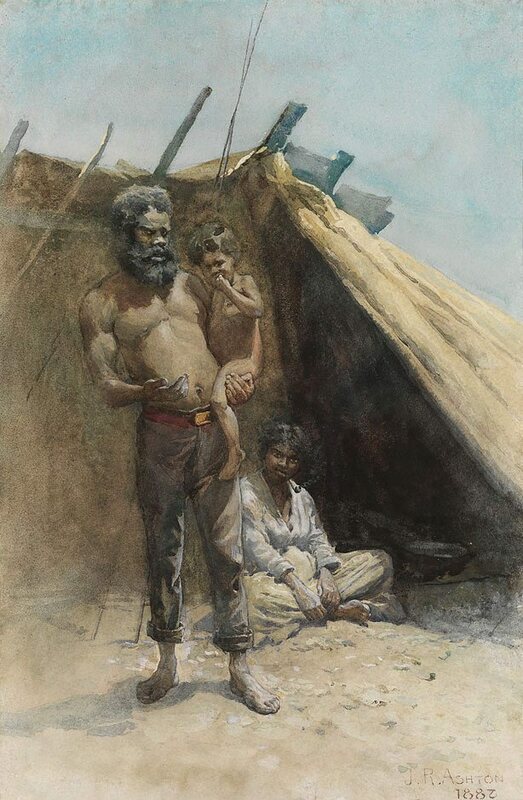 Julian Ashton was born in England and studied at the Royal Academy School, London, and at the Académie Julian, Paris, before coming to Australia in 1878 to work for the 'Illustrated Australian News' and 'Australasian Sketcher' in Melbourne. He moved to Sydney in 1883 to work on 'The picturesque atlas of Australasia'. Ashton was a major influence on the appreciation and teaching of art in Sydney, establishing his own art school, which still operates today. He was President of the Art Society of NSW and a trustee of the AGNSW. According to his autobiography, 'Now came still evening on' (1941) pg 53 Ashton visited an Aboriginal camp some miles out of Kiama on the south coast of NSW, where he remembered seeing "a fine looking native and his two lubras… They lived in a little construction something like an Indian wigwam. They had two children – a boy of about six years and the other just out of babyhood. I persuaded the father to allow me to make a drawing of them. He stood with his hand out and holding the younger child in his arms." Signed and dated l.r., "J.R. Ashton 188 (illeg.)". Australian images: Prints, drawings and watercolours from the collection , Sydney, 1979, 1. Everyday life: prints drawings and watercolours from the collections of Australian and European art , Sydney, 1994. Australian Artists Association Inaugural Exhibition , 1886, (illus.). titled 'Give blackfellow tobacco boss'.